I just went to see the movie Slumdog Millionaire. OMG I loved it, what a film. I would highly recommend it to anyone. 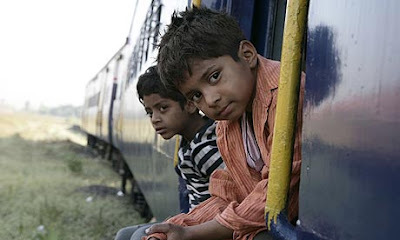 It's a moving story about the lives of two brothers from the slums in India. Having been to India on a speaking tour a couple of years ago, and having taken the trains over a large part of the country, made the story even more interesting. I was stunned by the whole film. It really captures the two realities of India - grinding poverty and the introduction of western values, consumerism and capital. You will not be disappointed after watching this masterpiece. 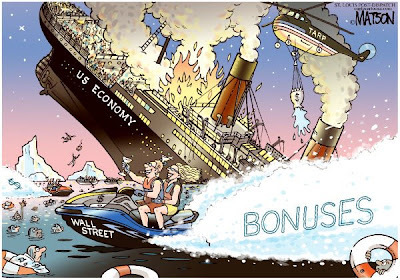 Why the left is to blame for the lackluster stimulus and bank bailout. Here is another version of the same basic message written by Chris Floyd called Shock Absorbers: Progressives Stunned by Obama Non-Surprises. And another point of view from Chris Bowers at Open Left with a piece called We are not a Movement. This is a crucial debate starting up about how we should now be organizing and whether or not we should be critical or accommodationist with Obama. This debate needs to multiply rapidly amongst grassroots activists. I read an article last night, written by old friend Tom Santoni from St. Augustine, Florida, that was a real personal testimony of a true activist. Tom called for the impeachment of Obama. This was not a light-headed rant but a real serious reflection on his own desire to be consistent. He said that if he was going to hold Bush to account for crimes against humanity, like killing innocent civilian people with US military drones, then he had to do the same with Obama who just a couple days into office sent the military drones into Pakistan (a sovereign nation). These unmanned aerial vehicles killed some number of children and other innocent folks. I wrote Tom and told him that I totally supported his position. I was on the street when Clinton was killing people in Yugoslavia, in Iraq, in Haiti, and other places. Few other activists joined us during those days. They did not want to offend other Democrats or offend organizational donors who were Democratic party loyalists. You can't have a movement that holds power accountable and be a party functionary at the same time. Sometimes you have to fish or cut bait. * Some good news for once. The $50 billion in taxpayer loan guarantees for new nuclear reactors and "clean coal" plants has been stripped from the final economic stimulus bill. Thousands of calls and emails were sent to Congress in an effort led by the Nuclear Information and Resource Service (NIRS). In an email this morning the groups says, "But make no mistake: the nuclear industry and its Congressional backers will try again, and sooner rather than later. Two days ago, for example, they began a new push to have nuclear power declared a 'renewable' energy source in Senate Energy Committee Chairman Jeff Bingaman's (D-NM) upcoming Renewable Portfolio Standard bill, which is intended to increase renewable energy production in the U.S. (although first indications are that the bill is much weaker than it should be). This is likely to become a major issue in March." Stay tuned. * More space junk is on the way after an American commercial communications satellite collided in orbit yesterday with a "nonoperational" Russian satellite 490 miles above northern Siberia. There will be lots of debris now flying at 15,000 mph that folks worry could severely damage the International Space Station (ISS). Many scientists have long predicted that someday the ISS would be destroyed by orbiting space junk as more and more of it is created by the tremendous growth of human space activity and the accidents that come with it. The parking lot in space is getting crowded so expect to see more of this. If too much space debris is created in orbit it makes the launching of rockets off the Earth problematic as it would resemble someone trying to swim through shark infested waters. * My home town newspaper, the Brunswick Times Record, yesterday ran a great editorial called Bath-built wind turbines? that gave strong support to a campaign by workers inside the Bath Iron Works Navy shipyard who are circulating petitions calling on Maine political leaders to "work as hard for the offshore wind farm in the Gulf of Maine as they do going after contracts from the military." The editorial features worker Peter Woodruff who initiated the petition drive. Maine media has reported that offshore wind turbines put in the Gulf of Maine could create the equivalent amount of power as 100 nuclear plants. The plan calls for 1,000 wind turbines that could create 30,000 jobs in the state if they were produced here. "This is a national security issue," they quoted Woodruff as saying, explaining that our country's over-dependence on oil makes us vulnerable to wars in the Middle East and turbulence in supplies and prices. This is the kind of worker organizing we need to see all over the nation. Congrats to Woodruff and his fellow workers. * Today is a National Call-In Day to Congress in support of a single-payer health care plan. Health care is a human right - take the profit and the insurance companies out of the system. Congressional switchboard: 202-224-3121. White House: 202-456-1414. If your Congress member is a current co-sponsor, thank your representative and ask them to stand firm for HR 676 and actively seek additional co-sponsors. If your member has yet to co-sponsor HR 676, ask them to please become a co-sponsor, select one or two talking points here. * Just a warning. Baseball spring training begins this weekend so be on the look out for more from me on the status of the Baltimore Orioles in 2009. They made quite a few trades and free agent signings over the winter. Hope for a winning season springs eternal! Renowned journalist (The Nation) William Greider lays it right out on this short video. He says the Democrats have helped create this mess in cooperation with the Republicans. You want hope? If you do then I highly recommend that we all stop being unquestioning loyalists for either political party as evidence is quite abundant that they are carrying water for the Wall Street, energy, weapons, insurance, agri-business, and pharmaceutical corporate interests. The American people have one major advocate - ourselves. And if we want real change, and real hope, then we'd better quickly realize that no knight on a shiny white horse is going to ride up and save us from this mess. Our saviour will be each other so we'd better not let the oligarchy talk us into turning on each other as this economy continues to collapse. Instead we have to turn to each other, take one anther's hand, and fight with and for one another. Cooperation, unity of purpose, looking out for each other - these are the antidotes to despair and resignation. Build a movement of the people, by the people, for the people. Give up the notion that the rich and the powerful give a damn about us. They are out to make us slaves - in the 21st century sense. The New York Times is reporting that the House & Senate have reached an agreement on the final stimulus package. It will run $789 billion (about $100 billion less than first expected) and is already causing some serious upset by more progressive members of Congress. The Times reports: Even before the last touches were put to the bill, the emerging deal infuriated some Democrats who said that President Obama and Congressional leaders had been too quick to give up on Democratic priorities. Some critics also suggested that the final figure was too small to be effective because of the grave condition of the American economy. And tell the same to your own Congressional delegation. We need sustainable (real green) technologies. With this pie chart in mind I thought I'd write a few things as Obama holds his first news conference as president tonight. Opening remarks: "Tax cuts alone" can't create jobs, he says. Last I heard 40% of the stimulus package was going to tax cuts. After passing both the House and Senate the $827 billion package will go to a conference committee to hammer out their differences. The Senate put in more tax cuts than the House did. The Senate cut out alot of money for aid to states who are in fiscal crisis. I wrote the members of Maine's Congressional delegation tonight asking them to take out the $50 billion nuclear industry subsidy. They won't do it. In his opening remarks Obama said nothing about the military budget which is eating up the vast majority of every tax dollar. The first question to him from the media asked if he was being too negative about the state of the economy - essentially scaring people. "I'm absolutely confident we can solve this problem, but we are going to have to take some significant steps," Obama replied. One significant step does not appear to be cutting the Pentagon budget. He is falling into the Republicans trap about responding to their criticisms that government should not be spending so much money. He should go on the offensive and talk about the cost of two wars and the 50% increase in military spending during the Bush years and make the point that we have to move money from there into creating green jobs - we need to create an industrial base that will lay a solid foundation for creating jobs. That means mass transit systems, wind turbines, solar and more which would require massive investment. Obama and Congress are only throwing pennies at these technologies. The second question is about Iran. His response: "Iran's actions have been unhelpful when it comes to promoting peace and prosperity around the world....we will be looking for openings.....it's not going to happen overnight....a nuclear Iran could set off a nuclear arms race in the region that could be unstable [nothing said about Israel's nuclear weapons]." Third question about bi-partisanship in Congress. He gets defensive saying "I didn't underestimate" the difficulties of working with the Republicans....He complains once again about Congress "playing the usual games". He just slammed the Republicans for presiding over a "doubling of the national debt" but doesn't mention that alot of that was the cost of two wars and legions of expensive high-tech weapons systems. His answers are much too long. He comes across as argumentative and lecturing. He sounds frustrated already. 4th question - consumer spending - should people who gets tax cuts save or spend? Does not answer directly but says once we get stabilized we are going to have to make serious cuts (Social Security, Medicare, Medicaid) because "there is no such thing as a free lunch." 5th question - don't we have to give the banks more money to really solve the credit crisis? "My immediate task is to make sure that the second half of the money ($350 billion of the original bank bailout) must not be wasted." It's clear that trying to put band-aids on capitalism's collapse just won't cut it. We need major systemic reform and neither Obama nor the Congress are going anywhere near that task. He keeps talking about the economy "growing again" but we must ask - grow from what? What do we make in this country? We are a nation of paper pushers and service industries. How can we grow when we don't have an industrial base (other than military) to create jobs for people? A question on Iraq. Four GI's killed in Iraq today. He calls them "our fallen heroes." "We are reviewing policies now." Shortest answer of the night. 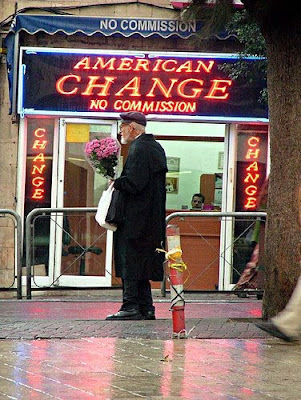 Afghanistan - Obama says the government there is "detached" which is code language for we need to change the leadership. "Through going review" underway. (Sounds like Vietnam talk) "Bottom line is the region served as a base to launch the attack" on 9-11. "We cannot allow the terrorists to operate there." He continues the phony lingo of the war on terror. Mentions Bin-laden. Sounded much like King George II on this one. Helen Thomas, the oldest member of the White House press corps who Bush would never call upon because she always had tough questions, asked him which countries in the Middle East have nuclear weapons today. "I don't want to speculate," he responded ignoring the fact that Israel has them. The US government sure doesn't mind "speculating" about Iran's nuclear program! Talk about a double standard - and the rest of the world knows it. He then talked about the US and Russia needing to get back to negotiations on nukes and honoring the NPT. The key to that happening is US willingness to back off "missile defense" deployments in Europe. Question about prosecuting the Bush pirate team for crimes. He avoided a response at first and talked about how he is not going to torture. Then he came back and said, "Nobody is above the law and if there are clear instances of wrong doing then people should be prosecuted just like ordinary citizens. But, I want to look forward rather than backward." Here's a prediction - we are going to see alot of this kind of talk from Obama. On the one hand and then again on the other hand. He is slippery at times. He ends the news confab and turns to walk back down the long red carpet lined hallway. His advisers will slap him on the back and tell him he did a great job. But the doubts will linger in his mind. He knows he blew off Helen Thomas. He knows he gave short shrift to Iraq and Afghanistan. He knows the economy is in big trouble and that more tax cuts aren't going to create the jobs that are needed. Listening to C-SPAN they took citizen calls after it was over. The 2nd call was an old woman and when they asked her if she supported the stimulus package she replied, "If it was going to help the poor people I would, but I think it is only going to help the rich." We've had such heavy snows here in Maine that the snow and ice buildup on our house roof has created huge ice jams with long ice cycles hanging from the gutters. 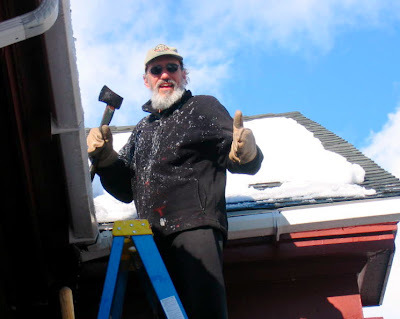 Yesterday was an unseasonably warm day so Maureen, Mary Beth, and I went out and began pulling snow off the roof and then we literally had to hatchet the ice in an attempt to break it to pieces and free the roof before the ice creates serious damage to the house. We spent about four hours working on it til our gloves and clothes were soaked to the bone. But we got most of the job done for now. This week I will buy a roof rake so next time it snows we can immediately rake off the snow and avoid this mess in the future. Sometimes we learn the hard way. NY Times: "You Try to Live on 500K in This Town"